Spring is the definitive time to be birding in Central Park. Although spring migration peaks in the first two weeks of May, northbound migrating birds pass through the park from early March until mid June. Spring migration is a little more compressed in time than fall migration and all the birds are in full breeding plumage as they pass through the park making identification a little easier (the males are often singing, too). The first migrant that puts in an appearance is usually the American Woodcock. These birds start to move into breeding territory when where is still snow on the ground, and the first ones can be found in late February looking for softer patches of ground in which to feed - the Oven is a good place for them, as is the Azalea Pond. They usually do not sing/display within the park, however. Passerines start coming through in March with the first push of hardy birds like American Robins, Common Grackles and Red-winged Blackbirds - all three of these species overwinter in the park in small numbers, but much larger numbers pass through in spring. As the month progresses they are joined by the other early migrants: Eastern Phoebe; Golden-crowned Kinglet; Pine Warbler and Fox Sparrow. Fox Sparrows are one of the first birds to be heard singing in the park in spring (Mugger's Woods in the Ramble is a good bet to hear one) apart from the White-throated Sparrows which basically sing all winter for reasons that are beyond my understanding. By early April the pace of migration lifts a little, and the hardier warblers appear. Pine Warbler, Palm Warbler and Yellow-rumped Warbler are all to be found. Early April is prime time for Louisiana Waterthrush migration, usually much less numerous than it's relative the Northern Waterthrush, but at this time of year Louisiana is the commoner of the two. Great Egrets and Black-crowned Night Herons reappear around the Lake. Barn Swallows and Northern Rough-winged Swallows join the Tree Swallows. Yellow-bellied Sapsuckers start to become numerous (a few may overwinter). By mid April Ruby-crowned Kinglet, Black-and-white Warbler, Black-throated Green Warbler, Blue-headed Vireo and Hermit Thrush are all fairly easy to find in the Ramble. Until the trees start to leaf out in late April, finding spring migrants is relatively easy both by song and sight. Once the canopy starts to fill in it takes much more effort, however. The spring of 2005 was an unusually productive year for Prothonotary Warbler (a classical "overshoot" species which breeds mostly to the south of us) which started to appear in mid April, and also for Yellow-throated Warblers which turned up a week or so later. Yellow-throated Warblers are never frequent in NYC, but a mini-invasion must have been going on since I also found one on a tree-lined street on Manhattan's Upper East Side purely by chance. Elsewhere in NYC more Prothonotaries were found, along with a Swainson's Warbler in Forest Park (Queens). Another overshoot bird, Swainson's Warbler is a real rarity in NYC - this one was my life bird. 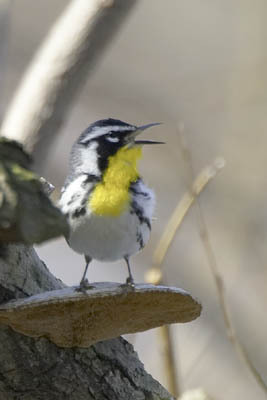 Spring migration kicks into full gear in late April and a host of new species put in an appareance: Northern Parula, Common Yellowthroat, Ovenbird being the most numerous of them. The switch over from early spring to mid-spring migrants occurs in the last week in April and corresponds to the canopy "leaf out" when finding birds becomes abruptly more challenging in the suddenly leafy trees. Fortunately the males will still be singing. The second week of May is the height of spring migration. The best days are the ones where the wind comes from the south, especially if preceded by a few days or northerly winds. The first or second day after the wind moves to the south (i.e. a warm front) are your best bets for the largest numbers in the park, especially if there was a little rain in the morning. On the best fallout days it can seem like every tree within the Ramble is loaded with migrants, and there will be birds everywhere else within the park too. These days are also the best ones to look for relative rarities like Cerulean and Golden-winged Warblers which are usually very difficult to find within the park unless they happen to be singing right near you. Golden-winged Warblers are on the decline in the north-east because of habitat loss and hybridization with the more numerous and range-expanding Blue-winged Warbler (producing the hyrbids "Brewster's Warbler" and the rarer "Lawrence's Warbler"). The most numerous species of warblers take a shift from the early migrants (Yellow-rumped, which peaks in late April) to American Redstart and Black-throated Blue Warbler which both peak in mid-May. The first male Blackpoll Warblers come through in early May but it is the arrival of the female Blackpolls that is the least welcomed since they often signal the winding down of spring migration. The last of the big fallout days are usually over by the third week May. Migrant fallouts occur in highly variable numbers from year to year and are entirely dependent on the right weather patterns. A typical late spring migrant is the Mourning Warbler, found mainly in late May after many of the other species have mostly passed through. Olive-sided Flycatcher also turns up in the latter half of the month (the first sighting of the year is often May 15th). The peak for Gray-cheeked Thrush is probably in the third week in May, and this is presumed to be the best time to find Bicknell's Thrush as well. The identification issues in separating Gray-cheeked from Bicknell's (Bicknell's was at one time a subspecies of Gray-cheeked) are considerable if judged by plumage alone. It is best to go listening for them in the early mornings, but having said that I've seen precisely one confirmed Bicknell's within the park which was cooperative enough to be singing right in front of me in the middle of a rain storm (David Speiser called me in from work to show me this particular bird). It was not visually distinctive from the Gray-cheeked Thrushes I'd seen that spring, emphasizing the magnitude of the ID problem these birds constitute. A very approximate guess is that about one in six Gray-cheeked-type Thrushes would be expected to be Bicknell's, and a fairly diligent searcher might turn up ten Gray-cheeked Thruses in a spring (more in fall, when of course they are not singing). By the beginning of June most of the migrants are already on breeding territory and numbers are low in the park. A few late or meandering birds still pass through (mainly females) but by mid June spring migration has basically come to a halt. There's always a few wandering birds, but these tend to be just singles. As spring migration winds down, species diversity plummets. There are something of the order of 20 species of breeding birds in the park. These range from introduced species like House Sparrows and Eurasian Starlings to typical suburban birds like Northern Cardinal, Mourning Dove and Downy Woodpecker. Although the habitat is reasonable, the sheer level of usage of the park during the summer months means that only human-tolerant species will be able to breed here. American Robins are particularly successful, fledging their first broods in May and in some cases the second and third broods as late as September. Less numerous species include Cedar Waxwing (attempted, 2003), Orchard Oriole, Wood Thrush, Eastern Towhee and Carolina Wren. Summer is one of the less desirable times to bird the park, in part because of the oppressive heat (the park tends to be even more humid than the rest of the city) and the crowds on summer weekends. Quite a few birders don't bird the park in June and July for that reason. The period of time between spring and fall migrations is gratifyingly brief and the breeding season overlaps both quite extensively. Yellow Warblers start to migrate south as early as the end of July, so there can be just a few weeks between the very last of the northbound warblers and the first of the southbound ones. By late summer the numbers of certain species like European Starling and in particular American Robin can be so swelled with the year's juvenile birds that they seem to be everywhere within the park. In the summers of 2003 and 2004, Black Skimmers visited Turtle Pond at night to feed. There is a large Black Skimmer colony out on the barrier beach at Breezy Point along with tern species, but that's quite a few miles as the Skimmer flies from Central Park and it's really not clear why the birds put in appareance in the park in those two summers. I'm not aware of any Skimmer sightings from summer 2005 although the early summer did see quite a few Common Nighthawks flying over Belvedere Castle (and the Ramble) at dusk. Common Nighthawks breed throughout the city and can (e.g.) be seen above Yankee stadium feeding on insects attracted to the lights. Fall migration starts in July with the first southbound shorebirds. Although Central Park is certainly not the shorebird mecca that Jamaica Bay is, some migrant shorebirds do stop to rest and feed. These are mostly Solitary and Spotted Sandpipers, to be found primarily on the Reservoir and the Lake. Sometimes a Least Sandpiper or two is to be found on the Reservoir. Greater Yellowlegs is a also possibility although your odds of finding it are low. Spotted Sandpiper migration continues into September. By late July the first trickle of southbound passerine migrants starts turning up - mostly Yellow Warblers, American Redstarts and Black-and-white Warblers and both species of Waterthrush. Louisiana Waterthrushes in particular come through early in both spring and fall in relatively low numbers. A few Ruby-throated Hummingbirds pass through the park early, although their peak numbers are in early to mid September. The numbers of migrants build steadily through early into mid August when Chestnut-sided, Canada and Blue-winged Warblers are also to be found with some regularity. Nevertheless numbers are still relatively low in mid-August, and it's not unusual to only have 5 species of warbler in a total of 10-15 individuals after birding a couple of hours in the Ramble. American Redstarts can be especially numerous by late August, their numbers decreasing somewhat into September but can still be found in early October. 2005 saw an unusually high number of the much sought-after Connecticut Warbler in various city parks, including one that persisted in Central Park for about a week - Connecticut Warblers are at best rare, but fall is the best time to find them as their usual spring migration path brings them nowhere near NYC. Single day numbers and species diversity continues to increase slowly but steadily through the end of August until about mid-September, which is often considered the peak of fall migration in the park. In some years there are still quite large migrant movements in late September and early October but usually only the hardiest warblers (Pine Warbler, Yellow-rumped Warbler and the much rarer Orange-crowned Warbler) will be found into mid-October. In 2003 Tanner's Spring attracted quite a good variety of warblers right at the end of September into the first week in October, but numbers dropped off rapidly after that. In 2005 fall migration really only produced significant numbers toward the end of September, but the truly big days were Oct 15-17th, where a lot of unusually late warblers were seen on Oct 17th with the passage of a cold front after 9 days of rain. Tens of thousands of Yellow-rumped Warblers passed through NYC on that particular weekend. This rather late movement of warblers probably reflects annual variation in migration timing due to weather patterns more than the effects of global warming although of course the two are linked. By late September the sparrow and finch migration is already ongoing and peaks during October. Species like Chipping Sparrow - that can be quite common at times - pass on through the park and do not overwinter. Swamp, Field, White-crowned and Lincoln's Sparrows are less numerous but still findable on good migration days. (Lincoln's Sparrows in particular appear to be becoming more numerous although still a good find). Savannah Sparrows are even less numerous and a few Vesper Sparrows might turn up from year to year. White-throated Sparrows are the most numerous wintering sparrow throughout the park, in variable numbers, together with Dark-eyed Juncos and a few Song and Fox Sparrows. The over-wintering sparrows are easiest to find at the Evodia Field feeders within the Ramble once the weather turns colder but in some years White-throated Sparrows can be found almost anywhere. Irruptive species pass through the park in highly irregular numbers from year to year. One of the more obvious of these are the Black-capped Chickadees which vary from quite common to almost absent in the park in fall, depending on the year. In particularly good irruption years the Chickadees overwinter and stay and breed the following year. Other irruptive species include Red-breasted Nuthatch, Pine Siskin, Common Redpoll and both species of Crossbills. While I've never seen either Crossbill species in the park, Pine Siskins are irregular migrants in small numbers, and during the Common Redpoll irruption winter of 2003/4 a Common Redpoll turned up at the Evodia Field feeders for a couple of weeks. In 1999, during another Common Redpoll irruption, a small flock of them were found feeding at the southern edge of Hallet Sanctuary by Ben Cacace. Irruptions correspond to food crop failures in the northern forests, so what is good for the birder is less good for the birds. Fall 2005 had a notable early and continued movement of Red-breasted Nuthatches, which is sometimes a predictor of a major winter finch flight year but the winter of 2005/6 proved to be a particularly poor finch invasion year with relatively few Purple Finches and no more exotic northern breeders. Some of the last species to come through are the hardy northern birds like Purple Finches, to be found from late September with stragglers into November. October also sees the Monarch Butterfly migration. The migration varies considerably from year to year, as the last generation of the season is the one that migrates, and more recently cold snaps in Mexico have killed considerable numbers on their wintering grounds. Fall 2005 was a better-than-average year for Monarch migration within the USA, and perhaps the population is rebounding to its previous levels. By the beginning of November nearly all of the fall migrants have passed through, leaving the park occupied with the resident birds, the regular wintering migrants (e.g. White-throated Sparrow, Dark-eyed Junco) and a few hardy migrants that chance their luck staying in the park over the winter. Species like Gray Catbird and Carolina Wren are regularly found on the Christmas Bird Counts in very low numbers, although it's far from certain that they make it to the spring. A late wandering Yellow-breasted Chat is sometimes found in the park. In the early winters of 2002 and 2004, vagrant Rufous/Allen's Hummingbirds have turned up in the park. The November 2002 bird was an immature female, probably an Allen's Hummingbird, found in the Conservatory Garden. The December 2004 bird was an adult female Rufous Hummingbird in Strawberry Fields. Rufous Hummingbirds are the most frequent vagrant hummingbird found in the east. Calliope Hummingbirds were found in Manhattan in early winter 2001 and 2002, and another Rufous Hummingbird was also found in 2002 - see my Hummingbird page for more details. Ducks take full advantage of the various water bodies in Central Park during the winter months, congregating on Harlem Meer, the Lake, the Reservoir, the 59th Street Pond and Turtle Pond. Especially on the ponds there can be a motley mix of wild species and hybrid Mallards. Any American Black Ducks should be viewed with a cynical eye since they all too readily hybridize with Mallards. Nevertheless wild birds like the American Black Duck, Northern Shoveler, Bufflehead and Ruddy Duck can be fairly common in November and December. Less common birds like Wood Duck and Green-winged Teal sometimes overwinter also, but it's at most one or two birds in these cases. Although winters in urban NYC are always a little warmer than in the surrounding areas due to urban heat pollution and the vicinity of the ocean, inevitably most or all of the water bodies in the park freeze at some point during the winter, usually in January and February. Small areas of open water can persist where the Gill flows into the Lake and at the northern edge of Harlem Meer - ducks may get concentrated in these locations, but many ducks leave the park altogether during the freeze for more open water. The freeze will sometimes bring it's own rewards, as Common Mergansers have sometimes been pushed down from more northerly areas - two or three spent part of the winter on Harlem Meer in the winter of 2002/3. The freeze can also catch some birds unawares - immature Great Blue Herons have a nasty habit of misjudging the onset of winter and sometimes turn up dead in the park. Early winter also usually brings a few owls into Central Park. The traditional wintering species include Long-eared Owl (as many as 5), and a few Northern Saw-whet Owl - one should always use the utmost discretion when observing owls as they are easily disturbed at roost. We often do not communicate owl roost locations to specifically reduce this disturbance. Rarer owls sometimes occur - in early January 2004 a Barn Owl spent a few days roosting on the west side of the park. However the most celebrated owl rarity was the December 2004/January 2005 Boreal Owl which was discovered on the 2004 Christmas Bird Count and which spent a few weeks near Tavern on the Green. This bird provided many people with their life Boreal Owl. The appearance of this owl corresponded with a major invasion year for Great Gray Owl and Boreal Owl in more boreal habitats (especially in northern Minnesota) due to a prey shortage further north, but it wasn't a bumper year for Boreal Owl sightings other than that. (A Great Gray Owl did make it into northern NY state, along with a spectacular number of Great Grays around Duluth, MN). Nearly as unusual, a Great Horned Owl spent a few weeks in the park over from Dec 2005 to Jan 2006 - Great Horned Owls are usually one day wonders and not seen every year. Another winter feature is the feeding station maintained by Lloyd Spitalnik and others in the Evodia Field within the Ramble. The thistle and sunflower feeders are a great attraction for the numerous small birds that overwinter in the park, especially during the periodic snowfalls. The local squirrels are also way too fond of them too. You'd expect the regular crowd of titmice, finches, sparrows and woodpeckers, but sometimes something rare turns up - a Common Redpoll spent a week or two at the feeders in December 2003. Less common wintering species like Red-breasted Nuthatch, Brown Creeper and Hairy Woodpecker are more easily found at the feeders than anywhere else in the park. The immature Cooper's and Sharp-shinned Hawks that sometimes overwinter in the Ramble are all too aware of the attraction of these feeders to hungry small birds. During hard winters with heavy or frequent snowfalls, these feeders save the lives of many small birds whose natural food sources are covered. As the ice thaws in March, some ducks return to the ponds and lakes and the first migrants start to push through. March seems to be one of the better times to observe rare gulls on the reservoir with Iceland, Glaucous and Lesser Black-backed Gulls being found there in recent years around this time. By March, spring migration is once again just around the corner. Not everyone can spend every single morning in the park, so sometimes it pays to pick your days carefully. Predicting migration movements is somewhere between an art and a science, and I would never claim that we understand all the factors. However there are a few basic principles: you'll see the most birds during periods that are traditional peaks of migration (early-mid May, mid-late Sept); you'll see the most birds when the previous night held southerly winds (spring) or northerly winds (fall). Empirically, migrant movements are largest when the wind is pushing them along. Some migrants seem to come on any wind direction, as long as it is not raining torrentially, but more migrants travel on winds that are moving in the same direction that they are. The best winds are out of the south-west (spring) or north-west (fall) since they tend to push migrants toward the coast and NYC. In both spring and fall, the best numbers in the park are seen when the wind changes after a few days of unfavorable winds. Sometimes the best numbers are seen the morning following the wind change, and sometimes the second morning after the wind change, but numbers of migrants then tend to drop off fairly quickly after the big days even if the winds are favorable, simply because most of the birds have passed through. Passerines in some ways behave as if they "wait" for favorable winds before moving. Although most birds look similar to each other and so it's difficult to tell, it's clear from some distinctive birds (e.g. a partial albino Northern Parula in fall 2003) that they hang around the park in the same area for several days, resting and refuelling before their next migration leap. We've seen this in both spring and fall although there's an expectation (bordering on dogma) that birds will move on faster in spring when they are anxious to reach breeding territory. Remember also that most passerines migrate at night, whereas ducks, geese and hawks migrate during the day. So for a good warbler day you want favorable winds overnight and for a good hawk day you want favorable winds during the day. If you can't be bothered to track the wind directions (I prefer Accuweather over Weather.com but both of them are better than the nightly news forecasts) you can just track temperature changes, which are highly correlated - shifts to warmer temperatures in spring and cooler temperatures in fall indicate the requisite warm and cold fronts that provoke the largest warbler movement. But the birds are riding the wind, not the temperature. Lastly, don't get too carried away with this - good birding experiences can be had on non-fallout days and I'd always recommend going birding on days that are not billed as big ones during both migration seasons. I found a Connecticut Warbler on Sept 17th 2005 on a day which could only be otherwise described as "slow" - only my second look at this species (my life bird was Sept 5th 2002 at Tanner's Spring). My life Mourning Warbler on May 27th 2000 was a spectacular and cooperative male on a day which also held few other warblers. When you have time, bird the park - you never know what you're going to find. Footnote: big days can be an epic experience. After something like 9 days of rain in NYC, a cold front pushed through on the evening of Oct 14th 2005, bringing migrants into the park (I had 11 species of warbler on Oct 15th). However a strengthening north-west wind overnight on Oct 15th brought enormous numbers of migrants through NYC: I was idly watching the trees on E108th St on the morning of Oct 16th from a friend's apartment and started to notice Northern Flickers, Blue Jays, White-throated Sparrows and especially Yellow-rumped Warblers flying through the neighborhood at or around tree-top level, weaving through the buildings. From 8am-noon I saw many hundreds of migrants, mainly Yellow-rumped Warblers, flying toward, over and through the park (and apparently continuing on south-west to NJ). On that same day Cape May in NJ had a movement of 40,000 Yellow-rumped, and it's likely that NYC had something like that number working their way through all five boroughs (reports from Staten Island, Bronx, Brooklyn and Manhattan all mentioned many Yellow-rumped). On the next day, Oct 17th, David Speiser had 17 species of warbler in Central Park - a remarkable number for October. The expected migrant push of late Sept was two weeks late, but made up for it in sheer numbers (Cape May reported another big migrant push on Oct 17th as well).